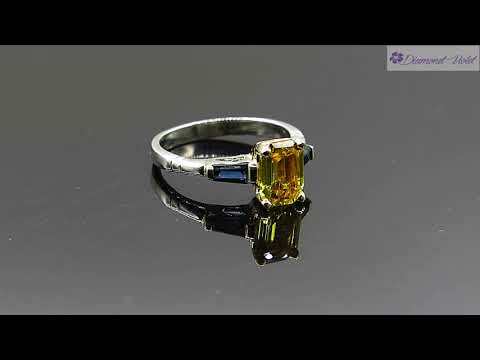 A Breathtaking Estate Vintage HANDMADE Platinum (tested) Engagement ring dazzles GIA certified NATURAL Emerald cut Yellow Sapphire; with measurements of 8.04x5.99mm; estimated weight is 1.57ct. GIA report # 5191337924. The center stone is set into 18k Yellow Gold. It is set with 2 Tapered Baguette Natural Blue Sapphires; estimated total weight is 0.49ct. The band tapers from 1.88mm to 2.38mm on the bottom. Finger size 6, can be re-sized. We offer FREE sizing with purchase. The weight of the ring is 4.50 grams, nice and SOLID. Sits medium from the top of the finger, approx. 6.20mm. Great Vintage Condition, little evidence of wear to the mounting in form of tiny scratches to the metal. Polished and ready to wear.